EyeSee360’s GoPano Micro is a case, attachment and software combination that turns your iPhone 4 or 4s into an odd-looking, but effective, 360-degree camcorder—for a mere $80 (plus shipping). Put the iPhone into the case (which looks pretty ordinary and doesn’t interfere with regular iPhone use), snap the cone-shaped lens onto the camera opening on the back of the phone, and run the free app to capture the action in all directions simultaneously. GoPano’s web site says the unwarped video size is 1280 by 304 at 30 frames per second for the iPhone 4, and 1920 by 456 at 30 fps for the iPhone 4s. The maximum vertical range is -43 to 40.5 degrees from the horizon. You can whirl your way through the panorama using the iphone, or by manipulating the downloaded video on a computer with your mouse (try this on the GoPano micro web site). You can even share your video by uploading it to GoPano.com. 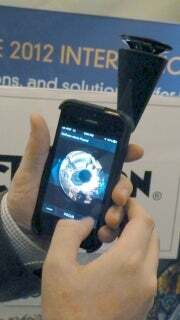 GoPano comes to us courtesy of EyeSee360, a company founded in 1998 as a Carnegie Mellon University offshoot.